Can Gastric Tonometry be Used to Determine Weaning Failure? Can the Intensive Care Standards of the Ministry of Health be Achieved with the Pricing Policy of a Social Security Institution? What Has Changed in Sepsis Management? Critically Ill Elderly Patient Mortality: Is Age a Risk Factor? Are Spontaneous Peak Flow Rates Predictors of Weaning? Has High-Frequency Oscillation Technique Any Benefit to Prevent Pulmonary Complications in Abdominal Surgery Patients? 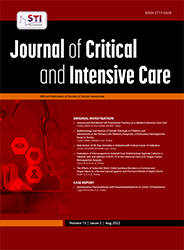 Sleep in Intensive Care: Is there or not? Is Dexmedetomidine Use Beneficial for Septic Patients on Mechanical Ventilation in the Intensive Care Unit? Opinions of Chest Physicians about Do Not Resuscitate (DNR) Orders: Respect for Patient Autonomy or Medical Futility? Opinions of Chest Physicians About the Do-Not-Resuscitate (DNR) Orders: Respect for Patient’s Autonomy or Medical Futility?